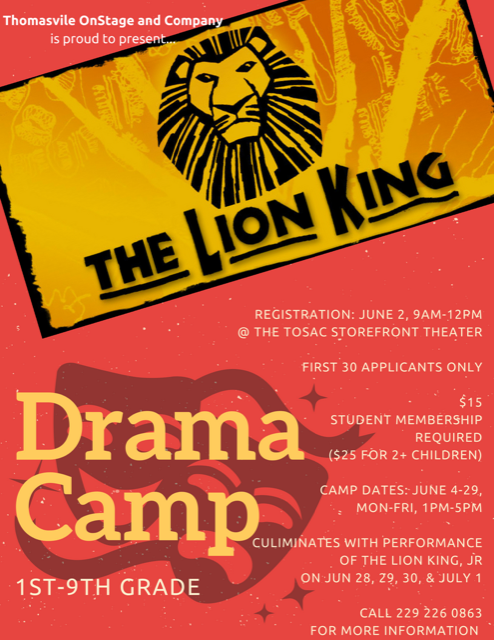 Thomasville On Stage and Company is offering a different approach to its TOSAC Jr. Summer Program with a “Kids Kamp” to be held for four weeks beginning on June 4th and concluding on July 1st. Registration will be held on Saturday, June 2nd from 9:00 a.m. until 12:00 p.m. at the Storefront Theater at 117 S. Broad St. The Kamp is limited to the first 30 registrants. Kamp will run Monday through Friday from 1:00 p.m. until 5:00 p.m. and will consist of an in-depth study of all aspects of theater. Many local experts will be guest speakers and instructors. It will afford an opportunity for participants to be immersed in every aspect of play production. It will culminate in a production of “The Lion King Jr.” with show dates from June 28th through July 1st. Tuition for the entire Kamp is $15 which includes TOSAC student membership and $25 for two or more kampers. Participants must be in grades 1 through 9. A parent or guardian must be present to register their student and sign required waivers and release forms.